Tragedies, no matter how big or small have one thing common; loss. Whether is it the mass murders of 85 children in Norway, a dozen (at this time) lives lost during the viewing of a Batman movie or someone taking their dog to vet for the last time. Tragedy is personal. No more so then on September 11, 2001. We all still know the exact place we were that faithful morning nearly eleven years ago. For some, it is still raw and for others, it is becoming a faded memory. Each person deals with it on their own terms. Brian Sloan’s 2003 play WTC View (and 2005 film) explores the emotional wreckage of 9/11 by having different prospective renters view a vacant bedroom left empty by protagonist Eric’s roommate and ex-lover. The apartment overlooks the site of the disaster which Eric watched unfold before his eyes. New York being New York where time is always of the essence, smoke and ash still lingering in the air, the would-be tenants visit the space and relive their own experience. As each person views the vacated room, Eric’s emotional state begins to rapidly deteriorate, and for good reason. 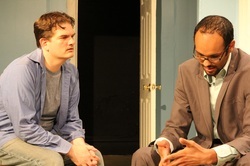 Michael Rashid directs the Chicago premiere of WTC View for Project 891 Theatre Company to great affect. With an engaging cast, lead by Ron Popp as Eric, it comes to pass that the story has less to do with jet planes crashing into buildings then it has to do with the more universal story of how those left behind deal with death. It is in that realm that WTC View works best. However, it is when Mr. Sloan’s script tries to cover more diverse territory that they play begins to feel long and overwritten. More than a decade has come and gone since that mindless act of violence occurred. In that time span, each of us more than likely, has had some form of loss to cope with in our lives. As the years pass, the character of Eric becomes more and more like an ‘Everyman’ for which we can all identify.